After the 30-4-1975 upheaval in Vietnam, many Vietnamese people hurried to escape from the country. They overcame many dangerous journeys that were full of risks. After many months waiting in refugee camps on the South-Eastern Pacific islands to be resettled to a third country, the Vietnamese refugees eventually came to stay at temporary centres in Midway Hostel (Footscray), Eastbridge Hostel (Nunawading), Enterprise Hostel (Springvale) in Victoria, Australia. With many feelings of being foreigners in a strange country, there were many worries about the new life and future. But the passion, faith and the need to worship God was always in the hearts of these Christians. They came together in God’s love to search for a place to worship God. At the end of 1979, there was a small group of Vietnamese Christians in Melbourne who were refugees from Vietnam. They desired to form a Church to come together for worship in Vietnamese language. In 1980 the Vietnamese Evangelical Church in Sydney introduced the group to Miss Doris Fletcher, a Deaconess from Syndal Baptist Church. On 10 August 1980, Deaconess Fletcher organised the first worship service for these Vietnamese Christians at the Balwyn Baptist Church. In this event, there were 28 believers and friends attending in the presence of Pastor Doan Trung Chanh, the pastor of the Vietnamese Evangelical Church in Sydney, and his wife. After this, the church appointed Mr Vu Phuc Thai as the group leader to liaise and organise regular Bible study and prayer meetings, and especially, to reach out to newcomers who had just arrived and were still living in hostels. The strong faith continued to grow in this small Vietnamese Christian group. Through moving the location of worship eight times, the Church took a long period of time to establish and organise itself and to evangelise to non-believers. In mid-November 1980, Deaconess Fletcher helped the church to organise the first outreach meeting for the Vietnamese at the Romanian Baptist Church in Richmond. There were 300 people attending and, thanks to God, 12 people made their faith commitment at this event. In early 1981, most of the church members were living in western Melbourne, so the place of worship was relocated to this area. Also in this year, through Ms Paula Kelly, the coordinator of the Indo-China Refugee Association (ICRA), the Church was able to rent a place of worship in Flemington. During this time, Deaconess Fletcher took the responsibility of preaching, and Mr David Gibson helped in leading worship services and fellowship. Occasionally, Dr. Sutherland, the Principal of Theology College in Canberra, also came to preach and conduct the Holy Communion Services to the church. By the middle of 1981, the Church had grown to 75 people and had invited Pastor Tran Thong from Canberra to be the Pastor of the church. 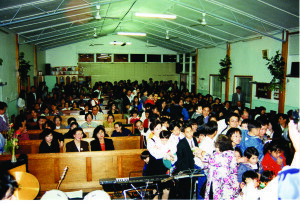 By the end of 1981, the church had rented the Lutheran church at 360 Barkly Street in Footscray for worship, had grown to 120 members, and had begun to have a vision of buying a church building. 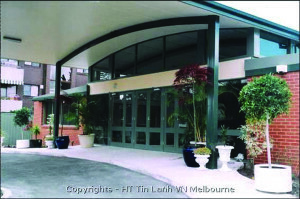 From 1984 to 1985, the church rented a hall from the Uniting Church at 215-217 Francis Street, Yarraville, with the number of members increasing to 150. On 17 August 1985, a Church Building Fundraising Committee was established with Mr Vu Phuc Thai as the leader. Reverend Rex Fisher lent AUD 5,000 to the fund.On 10 January 1986, the church bought a property at 34-36 Ballard Street,Yarraville for AUD 70,000 and converted it to a church building. A dedication service for the building was organised on 9 February 1986. In May 1990, Pastor Tran Thong resigned from the ministry. After five months of conflicts and difficult time, Reverend Ngo Minh Quang, the Senior Pastor of the Vietnamese Evangelical Church in Springvale, who was also the President of the Vietnamese Evangelical Churches in Australia, took the role of Senior Pastor of the Vietnamese Evangelical Church in Melbourne for 7 years (1990-1997). On 16-9-1994, the Melbourne church successfully acquired a double block of land at 41-43 Pickett Street, Footscray, at auction. The following year we bought the property next door from the Council of Maribyrnong and started planning to build a church there. On 4 January 1998, Rev. Tran Thanh Tam from Perth was invited to be the minister for the church. By mid 2000, the church sold the property at Yarraville to contribute towards the fund for building the church in Footscray. In mid 2000, after we had sold the first church building at 34-36 Ballard Street, Yarraville, we had money to start the first phase of building construc-tion at 45 Pickett St, Footscray. The Braybrook Community Centre in Churchill Avenue was hired for Sunday services and we stayed there until the end of 2002. When the first phase of building construction ended, we moved to the new church and had the Sunday service in the church hall. There were over 180 members at that time. The second phase of building started on 15 April 2005 and was completed on 20 September 2005. Mr and Mrs Tran Van Hung-Tran Thi Phuoc had taken a loan on behalf of our church for this peiod of time. The church building dedication service was held reverently on Saturday 12 November 2005. Over the past 35 years, God has been walking with, blessing, protecting and preserving the Vietnamese Evangelical Church in His grace and endless love.